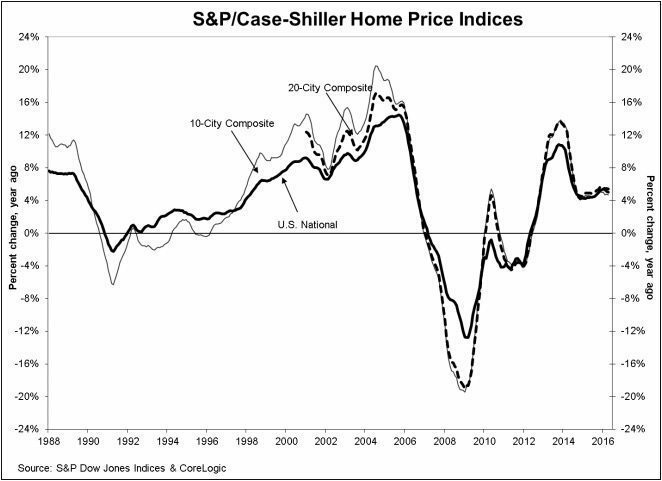 Dow Jones released its S&P/Case-Shiller Home Price Index for April 2016. April 2016's National index is at 178.69, a 5 percent year-over-year increase from April 2015 and a seasonally adjusted 0.1 percent month-over-month increase. The 10-City and 20-City composite boasted 4.7 and 5.4 percent year-over-year gains and 0.3 and 0.5 percent seasonally adjusted month-over-month gains, respectively. Portland, Seattle and Denver experienced the highest year-over-year home price gains, ranging from 9.5 to 12.5 percent. Meanwhile, Cleveland, San Diego and San Francisco were the only cities to experience negative month-over-month home prices. David M. Blitzer, Managing Director and Chairman of the Index Committee at S&P Dow Jones Indices, ended the report with a small warning for the future. Wise men say that what goes up must come back down, but home prices still haven’t gotten the memo. New monthly numbers from the S&P/Case-Shiller Home Price Index indicate that home prices are still rising, with no sign of slowing down anytime soon. April 2016’s national index is 178.69, a 5 percent year-over-year increase from April 2015 and a seasonally adjusted 0.1 percent month-over-month increase. In March 2016, the index was at 176.91, up 0.72 percent month-over-month. In March 2015, the index was 168.24 — that indicates an approximate 5.15 percent increase year-over-year for March.
.@SPDJIndicies: April 2016’s National Index is at 178.69 — a 5% y-o-y increase. ”The housing sector continues to turn in a strong price performance with the S&P/Case-Shiller National Index rising at a 5 percent or greater annual rate for six consecutive months,” said David M. Blitzer, managing director and chairman of the Index Committee at S&P Dow Jones Indices, in a press release. The 10-City and 20-City composite boasted 4.7 and 5.4 percent year-over-year gains respectively, and the cities of Portland, Seattle and Denver led the way. Portland reported a 12.5 percent year-over-year price increase, followed by Seattle with a 10.7 percent increase. Denver shored up the end of the pack with a 9.5 percent increase. SPDJIndicies: 10-and-20 composites showed y-o-y increases with Portland, Seattle & Denver reporting the highest price increases. The 10-City and 20-city composites reported 0.3 and 0.5 percent seasonally adjusted month-over-month increases, and only three cities (Cleveland, San Diego and San Francisco) reported negative monthly price changes. Although the index is trending upward, Blitzer is cautious about how future indexes will perform due to international and domestic political events, such as the Brexit vote and upcoming U.S. election in November. SPDJIndicies: Although the index is trending upward now, we should proceed w/ caution. “However, the outlook is not without a lot of uncertainty and some risk. Last week’s vote by Great Britain to leave the European Union is the most recent political concern while the U.S. elections in the fall raise uncertainty and will distract home buyers and investors in the coming months,” Blitzer said.